The global laser displacement sensor market is benefiting from the rising trend of industrial automation which is receiving government support in several parts of the world. This is leading laser displacement sensors to find applications across high-value areas such as robotics, machine tools, and material handling among others. Apart from this, increasing use of laser displacement sensors in consumer electronics and automotive sectors along with their rising demand from other industries is positively influencing the global market for laser displacement sensor. Further, laser displacement sensors are free of limitations that are exhibited by contact type displacement sensors which is leading to their rising uptake. On the flip side, high price factor and high maintenance of laser displacement sensor are proving to be a roadblock to the market’s growth. As per a report by Transparency Market Research (TMR), the global laser displacement sensor market stood at US$2,713.2 mn in 2016. Expanding at a CAGR of 7.6% for the forecast period between 2017 and 2025, the market will likely reach a valuation of US$5201.4 mn by 2025-end. The report studies the global laser displacement sensor on the basis of a few parameters, viz. range, end-use, and geography. On the basis of range, the segments into which the global laser displacement sensor market is divided are less than 100mm, 100mm to 300 mm, and more than 300mm. Of them, the segment of more than 300mm range holds dominance in the overall market. This is mainly because of the availability of an extensive range of sensors in this segment. In the coming years too, the more than 300mm range segment is expected to display relatively faster growth over other segments based on range. In terms of end-use, the global laser displacement sensor market has been segmented into automotive, industrial, aerospace and defense, and others. Amongst all, the segment of automotive held the leading share in 2016 and going forward too the segment is expected to hold on to its dominant position. The growth of the automotive sector is attributed to the extensive use of laser displacement sensors in the automotive sector to support the automated processes herein. 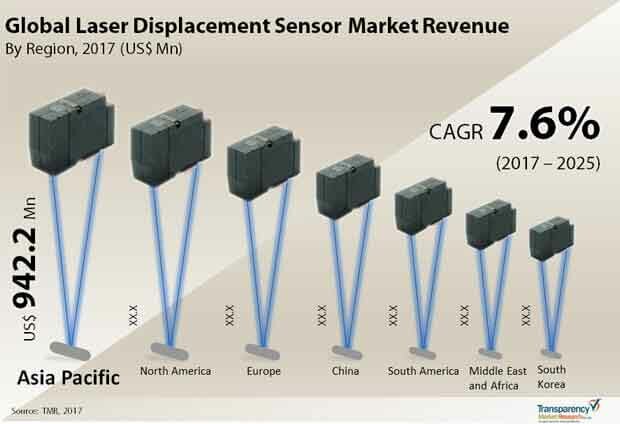 The global laser displacement sensor market, by geography, has been segmented into North America, Asia Pacific, Europe, South America, and the Middle East and Africa. Geographically, Asia Pacific led the global laser displacement sensor market in 2016 accounting for the leading revenue share. Powered by growth in China, India, Japan, and Korea the region is expected to continue to dominate over the forecast between 2017 and 2025. The growth of Asia Pacific laser displacement sensor market is attributed to the well-established manufacturing sector along with the presence of a large number of laser displacement sensor vendors. In addition, initiatives undertaken by several governments in the region, for instance, the ‘Make in India’ initiative by the Indian government to put India among the key manufacturing countries in the world is benefitting this regional market. While North America held substantial dominance in the global market in the previous years, in 2016, the region slipped to a close second to Asia Pacific. Europe market for laser displacement sensor is anticipated to rise at a significant rate to closely trail North America over the forecast period. Germany and countries in Western Europe are majorly fuelling the growth in this region. Leading players in the global laser displacement sensor market that are profiled in this report include SICK AG, Panasonic Corporation, TURCK GmbH Co., OMRON Corporation, Mechanical Technology Incorporated, MICRO-EPSILON, KEYENCE Corporation, Cognex Corporation, KG, ZSY Group Ltd., and Banner Engineering Corp. This report on the global Laser displacement sensor market provides analysis for the period 2015–2025, wherein 2016 is the base year and the period from 2017 to 2025 is the forecast period. Data for 2015 has been included as historical information. The report covers market dynamics including drivers, restraints opportunities, and trends expected to influence the global laser displacement sensor market growth during the said period. Technologies that are playing a major role in the driving the global laser displacement sensor market have also been covered in the study. The study provides a comprehensive analysis on market growth throughout the above forecast period in terms of revenue estimates (in US$ Mn) and volume estimates (in thousand Units), across different geographies. The Laser displacement sensor market is anticipated to witness an exponential growth during the forecast period from 2017 to 2025 owing to the increasing adoption of laser displacement sensor across various application areas especially in material handling, machine tools and robotics among others. Growing use of laser displacement sensor in automotive and consumer electronics segments and growing demand for laser displacement sensor from other industries including industrial and aerospace and defense are another factors driving the growth of the laser displacement sensor market, globally. The report also includes key developments in the laser displacement sensor market form 2015 onwards. The report also covers segment wise comparison matrix, market attractiveness analysis and market share analysis for all regions covered in the scope of study. Geographically, the report classifies the global Laser displacement sensor market into North America, Europe, Asia Pacific, Middle East & Africa (MEA), and South America; the regions are analyzed in terms of revenue generation. Furthermore, region wise prominent countries covered in the report include the following - the U.S, Germany, France, the U.K., China, India, Japan, South Korea, UAE, South Africa, and Brazil. The report also includes competition landscape which include competition matrix, market share analysis of major players in the global laser displacement sensor market based on their 2016 revenues, profiling of major players. Competition matrix benchmarks leading players on the basis of their capabilities and potential to grow. Factors including market position, offerings and R&D focus are attributed to company’s capabilities. Factors including top line growth, market share, segment growth, infrastructure facilities and future outlook are attributed to company’s potential to grow. This section also identifies and includes various recent developments carried out by the leading players. Company profiling includes company overview, major business strategies adopted, SWOT analysis and market revenues for year 2015 to 2016. The key players profiled in the global Laser displacement sensor market include SICK AG, OMRON Corporation, KEYENCE Corporation, ZSY group LTD, Panasonic Corporation, Mechanical Technology, Incorporated, Cognex Corporation, Banner Engineering Corp., TURCK GmbH Co. KG and MICRO-EPSILON.